As a continuation to our stone series, we are now diving into the world of sapphires. You might have heard of this precious stone from media outlets around the world when Prince Charles proposed to Lady Diana with a sapphire ring or, depending on your age, when Prince William (Charles and Diana’s son) used the same exact sapphire ring to propose to his then girlfriend, Duchess Kate Middleton. However, there’s more to the stone than what meets the eye. In this post, we explore the nitty gritty details about this famous blue stone and what makes it stand out from the rest of the precious stones. 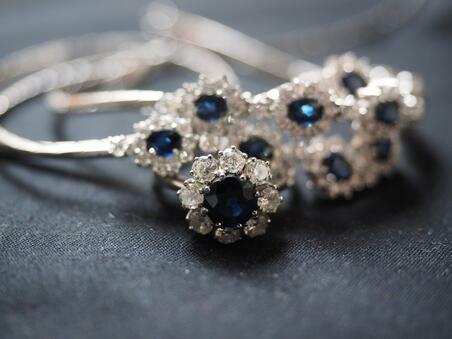 It is said that sapphires exude power because of its deep blue hue. Power is, almost exclusively, synonymous with royalty and with people in positions of authority. In ancient lore, kings, queens, and the most respected of warriors were always garbed with sapphires for two main reasons: as a status symbol and, here comes the mysterious part, as a powerful defense from harm. Yes – you heard that right. Ancient folks believed that sapphires protect you from different types of physical injury. Back then, when myth and science were two very mysterious things, sapphires were believed to be some sort of protective amulet or talisman for people that are afraid of curses, illnesses, and physical injuries. Maybe sapphires are to European royalty as emeralds are to Cleopatra. The word sapphire came from the Latin word saphirus and from the Greek word sapheiros both meaning blue. It is believed that sapphires date as far back as 800BC and that ancient Persians believed that the sky was painted blue due to the reflection of sapphire stones. It is also believed that the Tablets of Stone (the stones where the Ten Commandments were written) were made of sapphire. Sapphires come from the mineral corundum. Corundums are hard, tough, and stable minerals that consist of aluminum oxide with a trigonal crystal structure. Scientifically, sapphires and rubies come from the same mineral, but the two stones differ in color. Sapphires are considered as one of the hardest stones in the world and the only stone stronger than it is, you guessed it, the diamond. Sapphires, as mentioned above, are relatively sturdy. According to the Mohs Scale of Hardness, Sapphires measures at number 9 which makes it stronger compared to other stones like emeralds, turquoises, pearls, opals, etc. Sapphires are known for its deep blue hue. But did you know that it can come in many different types of colors? Sapphires can be colorless, yellow, green, pink, and orange. Get it? Let us provide a bit of context – did you know that the most famous sapphire, called the Star of India, is a 563-carat sapphire? You heard that right – 563-carats of sapphire in one stone. Currently, the Star of India sits at the American Museum of Natural History. According to its official website, the Star of India is around 2 billion years old and considered as one of the most well-known objects in the world. In addition, the name Star of India was coined due to the stone’s milky quality and patterned three-fold fibers which makes it looks like a star – these star sapphires are highly sought after but incredibly rare. The rarest type of sapphire is the pinkish variety called the padparadscha – a name that comes from the Sinhalese word for lotus blossom or lotus flower. Madagascar padparadschas are said to be one of the best in the world – padrapadschas can also be found in Sri Lanka and Tanzania. Sapphires can be found anywhere in the world. However, most of the high-quality sapphires on the market today come from Australia, China, Sri Lanka, and the USA. Sapphires can also be found in mostly the south east Asian countries of Vietnam, Myanmar, Thailand, Cambodia as well as African countries such as Tanzania and Madagascar. Purity of color, in any sapphire variety/hue, is the most desired sapphire characteristic. It is known that sapphires that have brown or gray spots within should be avoided. Sapphires that have a deep saturated hue and no inclusions (or imperfections that can be seen by the naked eye) are always more expensive. Although not as important, a sapphire’s cut is also significant in its own right. A sapphire’s cut refers to how it was polished from its rough state and is graded by its symmetry, windowing, extinction, and brilliance. The standard size for a round sapphire is 6mm which is the equivalent of a .75 carat diamond according to Brilliant Earth. Typically, the larger the gem, the more expensive it can be. Much like other stones, sapphires are also prone to inclusions. If you see a sapphire with little to no inclusions should only prompt one thing: doubt. The reason being is that sapphires that have no inclusions might be synthetic – which means that it is the exact imitation of a sapphire since it basically has the exact same physical and chemical attributes. If you are more of a purist, synthetic stones might not be for you. It is suggested that your sapphire should be professionally cleaned and inspected every six months. Besides keeping your rare natural untreated sapphire jewelry as sparkly and as gorgeous, regular inspection of your ring ensures that your sapphire is in tip-top shape. Cleaning your sapphire using a brush with baking soda, water, salt, and dish soap solution is the way to go. If you don’t have any of the stuff mentioned above, you can always rely on regular soap and water to get the job done. Remember to close drains and avoid long drops to hard floors. Another way to clean your sapphire jewelry (depending on the other materials that it has) is to soak it in a bowl of warm water and let the dirt loosen up. Afterwards, lightly scrub your sapphire with your soft bristled toothbrush or soft cloth. Rinse as needed. Thinking of selling your sapphire? Talk to Luriya! Luriya has been in the jewelry business for almost three decades with the mission to provide customers with not only he best prices but also the best customer service available anywhere. Visit our official website at www.luriya.com to set up an appointment!